Wide range of diverse and trendy designs in gold (18 K & 22 K), IGI certified diamonds and precious gem jewelry is on display and sale. 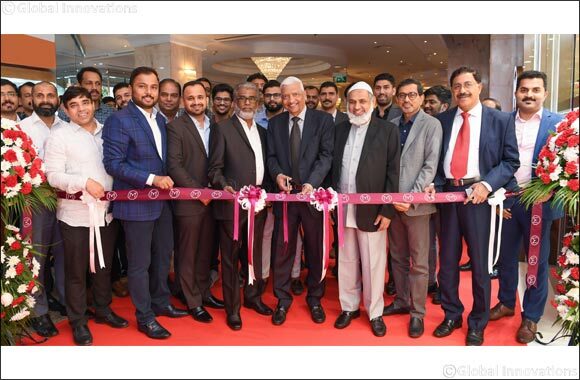 Dubai, UAE, January 14, 2019: Malabar Gold & Diamonds, one among the largest retailers globally has opened a brand new outlet in Millennium Dubai Airport Hotel. With this store, Malabar Gold & Diamonds will be targeting the international transit passengers at Hotel. Malabar Gold & Diamonds is excited to open an outlet to exclusively cater to international tourists and has introduced a wide variety of unique and trendy collections suitable to multinational and multicultural customers. The latest showroom of Malabar Gold & Diamonds was inaugurated on 10th Jan, 2019 by Mr. Salahuddin M, Director – Malabar Investments Limited, in the presence of Mr. Shamlal Ahamed, Managing Director – International Operations, Malabar Gold & Diamonds, Mr. Abdul Salam KP – Group Executive Director, Malabar Group, management team members of Malabar Gold & Diamonds, other dignitaries, well-wishers & guests. “We have got a wide acceptance in the global market place and our core business values such as adherence to transparency, honesty, quality along with our value added services, product designs that suits to every class of customers. We already have stores in concepts such as High Street, Mall, Department Store, Airport & Kiosk and by opening our latest store in the Millennium Dubai Airport Hotel we are entering to a new concept. The VAT refund scheme has made jewellery shopping more attractive for tourists now and our new store will make gold and diamond jewellery shopping for all tourists convenient especially for the transit passengers” said Mr. Shamlal Ahamed – Managing Director – International Operations of Malabar Gold & Diamonds. The outlet unveils a significantly large collection of traditional as well as contemporary designer jewelries. The exquisite range of collections in the new outlet can hold you spell-bound with their awe-inspiring beauty and classic designs. Like all their other outlets, this outlet also will exhibit a wide range of diverse and trendy designs in gold (18 K & 22 K), IGI certified diamonds and precious gem jewelry from Italy, Singapore, Bahrain, India and other countries. The branded jewellery segment of Malabar Gold & Diamonds that includes that includes Era - Uncut Diamond Jewellery, Ethnix - Handcrafted Designer Jewellery, Mine - Diamonds Unlimited, Precia- Gem Jewellery, Divine – Indian Heritage Jewellery and Starlet - Kids Jewellery are also displayed in the newly opened store.